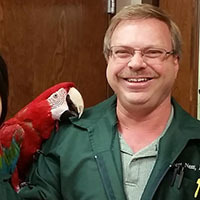 Dr. Robert Ness graduated from the University of Illinois College of Veterinary Medicine in 1990 with a strong interest and determination in avian and exotic pet medicine. His first employment as a new graduate was as an associate veterinarian for the only all avian and exotic pet practice in the Chicago area at the time. He spent 9 of the next 12 years at that practice, with the other 3 years serving as head exotic veterinarian for a prominent group of veterinary practices, also in the Chicago area. During his tenure at these practices, Dr. Ness continued to expand his knowledge and training, but kept thinking that there was more to being an animal healer than just mainstream medicine. As frustrations grew over the limitations of standard conventional care for chronic diseases and common problems encountered in his patients, Dr. Ness began exploring the realm of holistic medicine and, as they say, the rest is history. In June 2002, Dr. Ness started Ness Exotic Wellness Center as an alternative to the typical veterinary hospital. He continues to develop his wealth of knowledge by adding new and innovative treatments to his practice, becoming widely respected and regarded in the field of Avian and Exotic Pet Medicine, especially in the field of Holistic Therapy. He is presently one of the very few practitioners in the country practicing Holistic Therapy for Avian and Exotic Pets.